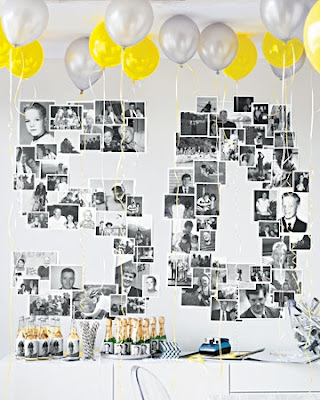 Inspired Honey Bee: celebrate: lordy lordy, look who's ..
celebrate: lordy lordy, look who's ..
.. forty! A: my brother-in-law. Since it’s kind of a big birthday, my sister-in-law decided to throw him a surprise party. I offered to be in charge of the décor. Thank goodness for Pinterest! I got most of my ideas from fellow pinners and I wanted to share the project that I got the most compliments and questions on. I only wish I could take the full credit for this one, but the original idea comes from Martha Stewart. And I just can't take on one project so I have a DIY tag stamp to share. I’m a sucker for things that come in pretty packages. When I saw this next pin, I knew I had to make it. 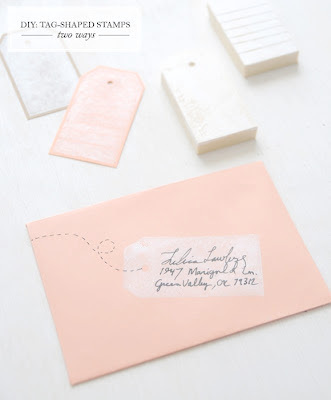 This darling DIY tag stamp is sure to add that extra something to any envelope or package. It was very inexpensive and easy to make. The idea comes from the Creature Comforts Blog. My creation really is getting all of the attention.